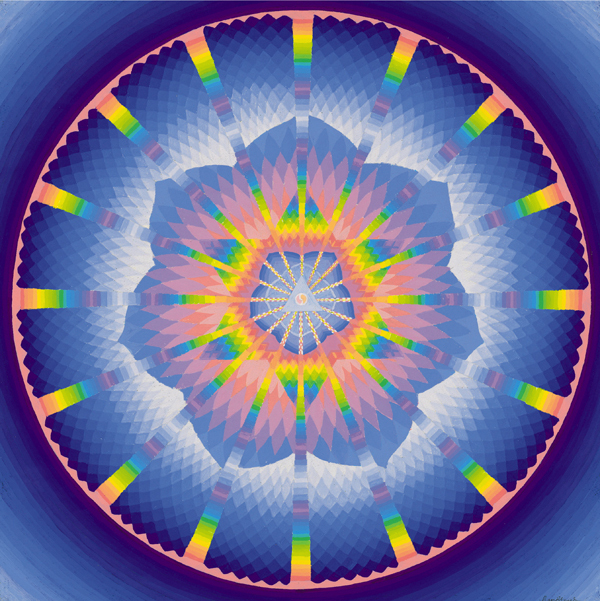 This mandala explores various principles and has an energising quality with a strong centre. The geometrical shapes that constitute the structure of the mandala proceed numerically from 0 to infinity symbolising the movement from limited consciousness to Unlimited Infinite Consciousness. This movement is represented by the central dot, proceeding to the yin yang, triangle, square or 4 petalled lotus, 5 petalled lotus, 6 pointed star, and the 7 petalled lotus which unfolds into the 1000 petalled lotus representing the Crown Chakra. Elektra is a powerful mandala which can be used for meditation and healing or simply to decorate and enhance any environment.